Gwynneth Schell is a Licensed Professional Counselor providing mental health care for adults with a wide range of concerns. Gwyn received her M.Ed. in Community Counseling from Loyola University Chicago and her PhD in Counseling Psychology from University of Wisconsin – Madison. 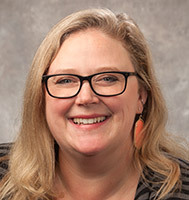 She has experience with multiple treatment modalities including brief psychodynamic therapy, cognitive behavioral therapy, Interpersonal therapy, dialectical behavior therapy, and trauma therapy. Gwyn specializes in work that promotes self-awareness and emotional resilience. Clients’ lives are complex, as their therapist, it is my job to understand this complexity coupled with their psychological needs to facilitate the realization of client goals. I see my role as understanding the client and their environment in a holistic way and using that knowledge to promote exploration and growth. Beyond understanding why people act the way that they do, I collaborate with my clients to apply that understanding to interventions that facilitate positive change.